The Pioneer Valley will soon be the home of a special kind of forest: a unique “living laboratory” to demonstrate the benefits of sustainable forestry on climate change resilience. 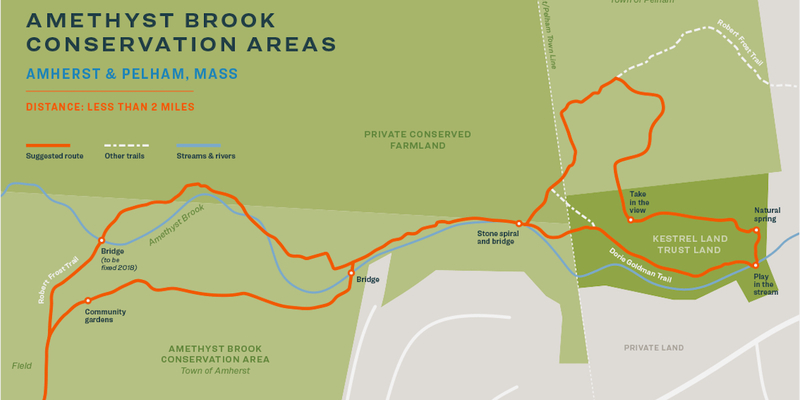 In partnership with several private woodland owners, the Town of Pelham and Kestrel Land Trust have just created the new 161-acre Buffam Brook Community Forest, only the second of its kind in Massachusetts. This area will become a publicly owned forest, managed for the educational, recreational, and economic benefit of the community. The partnership will include the University of Massachusetts Environmental Conservation department and the Hitchcock Center for the Environment, providing students of all ages opportunities to learn about caring for our forests. 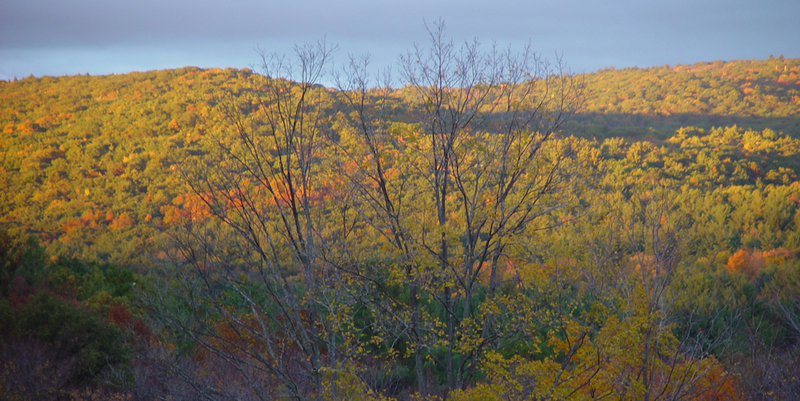 The Town of Pelham Conservation Commission and Kestrel Land Trust recently announced the acquisition of 161-acres of woodlands from private owners to create the Buffam Brook Community Forest, west of the Quabbin Reservoir, the second of its kind in the State of Massachusetts.  The Community Forest and Open Space Program is a United States Forest Service Grant that funds local acquisition of land to create a publicly owned forest that is managed for the educational, recreational and economic benefit of the community. This project is the culmination of years of work between the landowners, Kestrel Land Trust and the Town of Pelham to protect this important landscape, which supports endangered species habitat, local water quality, and climate change resilience. 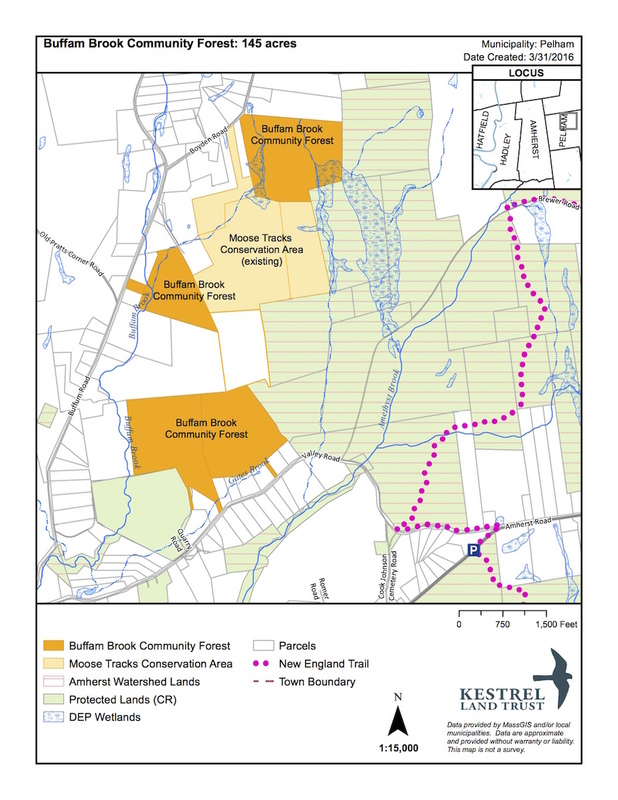 The Buffam Brook Community Forest will be owned and managed by the Pelham Conservation Commission, in partnership with Kestrel Land Trust, which will hold the perpetual Conservation Restriction on the land. The public will be welcome to use designated trails for walking and cross country skiing, and portions of the land will be open to hunting, where permissible by State hunting safety regulations. The focus of the forest stewardship plan will be to support forest resilience by increasing the species diversity and structural diversity of the forest in order to decrease recovery time in the event of a large disturbance, like severe weather events associated with climate change, including flood, hurricane, tornado or drought. Changing environmental conditions over the upcoming years due to climate change will likely cause additional stress to the Northern Hardwood forests of Massachusetts. According to the US Environmental Protection Agency: “The Northeastern climate is experiencing noticeable changes that are expected to increase in the future. An advisory group of community volunteers will come together this Spring to develop a Forest Stewardship Plan in a time of climate change. Paul Catanzaro, Extension Associate Professor at the University of Massachusetts, worked with students in his Forest Measurements class to conduct an inventory of the properties that make up the Buffam Brook Community Forest. “The size of the properties and the forest on them is very typical for Massachusetts, which is its strength. The Buffam Brook Community Forest provides an excellent opportunity to demonstrate different forest stewardship techniques that landowners can implement on their own land to increase forest resiliency.” Paul explains, “it also provides the chance to monitor the forest over the time so that we can better understand the forest’s response to the challenges they face.” This partnership of community members, town conservation commission, the regional land trust, and educational resources will continue to support the forest to meet its education and recreation goals. The forest will also be used for public programming to teach about the impacts of different management techniques. Known as a ‘demonstration forest’, landowners will visit to learn how management can support different goals and what they can do with their own land. Typically, demonstration forests total in the thousands of acres, which can be difficult to translate for individual landowners who typically own around 100 acres. 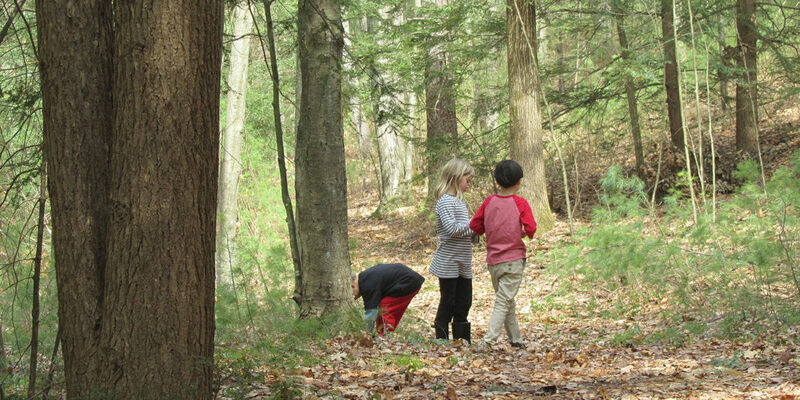 Due to the relatable size of Pelham’s Buffam Brook Community Forest’s 161 acres, there is great potential for private landowner education. 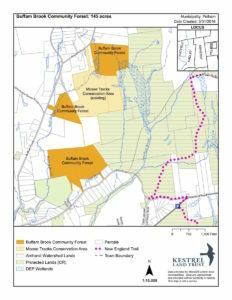 As Kestrel Land Trust and The Town of Pelham begin the next phase of planning for the Community Forest, partnerships with other organizations, like the Hitchcock Center for the Environment, will be leveraged to increase the outreach and learning potential on this land, including programs for younger populations to use the forest as a outdoor classroom. The total cost of this project was approximately $585,00, which was covered by a $257,000 grant from the US Forest Service, $100,000 from Pelham’s Community Preservation Act Funds, $162,500 in Bargain Sales from the landowners, and $70,000 raised by Kestrel Land Trust from private foundation grants. The Community Forest is adjacent to more than 1,000 acres of protected watershed land, owned by Town of Amherst in Pelham. Read more from the Daily Hampshire Gazette. What Does the 2016 Election Mean for the Valley’s Lands? next post: 63 Acres of Foxcroft Farm Conserved — 4 Acres Still to Go!